Based on the 1985 novel by Canadian author Margaret Atwood, you will hear a lot of big words used to describe this show. The IMDB description says “Set in a dystopian future, a woman is forced to live as a concubine under a fundamentalist theocratic dictatorship.” which is more 50 cent words than your average sentence involves. I prefer the version that Elisabeth Moss gave on the Seth Myers show. “Try to stay with me it is a little far fetched. It is about a right wing fundamentalist group who takes over the government, and takes away all of women’s rights.” The story really is not quite that simple and it is not just the womens rights that vanish – plenty of men get punished and killed on this show as well. Though there is one scene where you might be right on board with that as a concept. I read the book a few months ago knowing this series was on the way and knowing I would want to see it because Elisabeth Moss is one of my long time favourites. She is the true star of this series, she is the center of this story and she is absolutely magnificent. She will greatly deserve every award she wins and I have no doubt it will be all of them available. However she might face some competition from Evan Rachel Wood for her incredible performance in WestWorld. 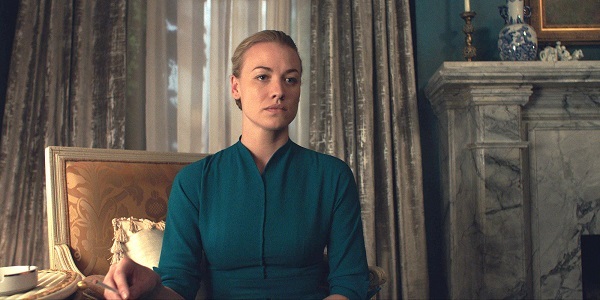 When I heard that Joseph Fiennes would play the Commander and Yvonne Strahovski would be Serena Joy, I really could not picture that having read the book. I had seen much older people in those roles. However it has worked out for the best, because somehow Yvonne made me feel empathy for Serena Joy – certainly not something I expected and not something I experienced when I read the book. Samira Wiley – who Orange Is The New Black fans will know as Poussey – is another stand out cast member in a show full of amazing performances. O-T Fagbenle is incredible as Luke and Max Minghella is great as Nick the driver. The costumes are beautifully done. Taken by itself this show is terrifying enough. When you combine it with some of the other shows of recent times – WestWorld in particular has some similar themes along these same lines and I typed some thoughts about that here – we might be in the middle of peak television right now, but it is also the middle of scary as heck television, in my opinion. This is NOT a show to binge watch. You need to take some time between episodes. You need to let it sink in. The first 3 episodes are especially heavy to watch. This is not a show for right before bedtime because it will make you think and you won’t get to sleep. I’ll be honest and say even when I watched the episodes early in the day I found myself thinking about them at bedtime. They resonate pretty strongly. This version of The Handmaid’s Tale is on my list as well. I agree, Elizabeth Moss is a mesmerizing actress. I like how she tackles the unglamorous, gritty and sometime unlikeable characters in her work. Elisabeth is brilliant in this series, and it is a show that sticks with you and gets under your skin. At least it was that way for me. I can’t wait to find out what happens in the second season. :) I also will be interested to read your thoughts once you have seen it, SSG! Re your final sentence: I recently finished the book and while I was reading I thought this could actually happen if certain persons remain in power and get their way. I don’t want to see the series, even if it comes to regular TV. Just finished the book and want to watch the TV series now but worried it will get too far under my skin . . . !